Yesterday’s labour force data for the March quarter came out much as expected: forecasters had been expecting a 0.6% increase in employment, and they got it, and they also got their predicted 4.4% unemployment rate, down from 4.5% in the December ’17 quarter. Even if there were no immediate dramas in the data, it’s still worth picking out one aspect – a reminder of how unemployment rates vary by ethnicity. 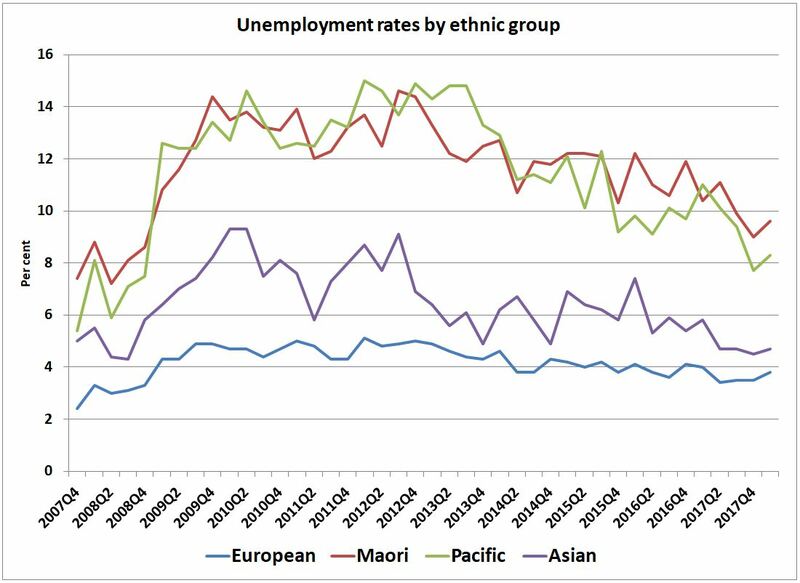 The European and Asian rates are very much lower than those for Maori and Pacific people, and if you knew nothing else about New Zealand than what this graph showed you, you’d diagnose that we have some serious social issues to grapple with, and you’d rightly be looking very hard at our education and training systems and our active (or inactive) labour market policies. But another interesting aspect is the very different cyclical behaviour of the ethnic unemployment rates. When bad times strike, groups that find it harder even in good times to find a job are disproportionately affected. That’s the pessimistic read: the optimistic read is that a prolonged period of decent GDP growth will bring even the higher ethnic unemployment rates down. The Maori/Pacific rates, which got as high as 14-15% in the aftermath of the GFC, are down to 8-9% – still too high, but a hell of a sight better than they were. And the gap with European/Asian rates will keep on narrowing as long as GDP keeps trucking along at a decent rate. Exactly the same happens in countries overseas: I gave a US example a while back (‘Rising tides lift all boats’). The policy lesson from this is worth repeating. There are people who have concerns about the impact or value of ongoing economic growth: environmental damage, for example, would be high on many people’s lists. The lesson is, don’t imagine that restraining growth will be socially costless: as the data here and overseas clearly show, the people that will be hit worst are those on the outer. Find smart ways to contain or prevent the concerns that worry you, but otherwise push GDP along as fast as you can: it’s the ticket to a better livelihood for the people you likely worry most about.